What is the best way to get regulated 12V DC output from my bike generator? Use a DC to DC converter which takes an input voltage up to 60 volts DC and puts out a constant voltage of 14.4V DC. This approach is typically the most efficient method. Usually this voltage can be adjusted up or down 10 to 20% with a small screw driver. So if you want exactly 12 Volts output, then you can use a screw driver and a DC volt meter to set the output exactly how you want it. If you want to get one of these DC to DC converters, click here. Use a linear regulator. This type of approach is less efficient then the DC to DC converter. It also requires a much bigger heat sink when your incoming voltage level is higher then your output voltage. For example if your pedal power bicycle generator is putting out 40 volts and the voltage regulator is putting out 12 Volts, then there is a 28 Volt drop across the regulator. If you are putting out 5 Amps of current, the power dissipated from the regulator will be over 100 Watts of power. That means you need a really big heat sink. For low power applications like charging a cell phone, the best way to go is using a car alternator. It puts out a constant voltage of 14.8 Volts which is the typical operating voltage of any U.S. made car. I successfully used 24 of these alternators to build 24 cell phone charging stations for the Coachella 3 day rock concert which had an attendance of 60,000 people a day. 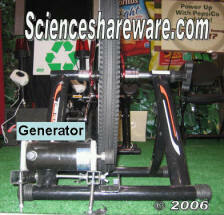 16 of these same bike generators were also featured on the Ellen Degeneres show in May 2007. Keep in mind that to use the GM 1-wire 63 Amp Alternator you need to hook it up to a protective resistor so that it doesn't get damaged when some one gets on and pedals without a load. See instructions how to do this HERE. Almost anything you hook up in the cigarette lighter of your car is able to run at 14.8 Volts DC. For instance in AC inverter typically has an operating range up to 15 Volts DC. So you could use a car alternator to provide power to an AC inverter which could power a play station video game or X-box video game, or laptop computer, or TV set. You may not think that 7 Watts is much, but believe me, after 5 minutes of heating up at this wattage, you will get a burn by touching a diode that is not rated for that kind of wattage. If you were to get a T-42 diode with a heat sink then you would be OK. The linear regulator is the traditional way of controlling your output voltage to a 12V DC level but not the most efficient way . For example the LT1083CP-12 is a monster sized 12V regulator that you could use. It's less than an inch wide, but it is huge when you consider that it is about the biggest 12V linear regulator sold commercially. Typically a 12V regulator can handle only 1 Amp of current. This one can handle 7.5 Amps. It's max input voltage is 25V DC. This is sold by Digikey for $13.25. There are a few considerations to take into account when evaluating this option. If some one gets on your pedal bike generator and shows off by pedaling really fast, they might toast this regulator because it can only handle a max input voltage of 25VDC. To prevent this from happening you could put in a protective mechanical relay with audible alarm that opens up when the bike generator reaches ~20VDC. The amount of heat you need to dissipate from this regulator is based on how much higher than 12V your pedal power bicycle generator is running at. For example let's say you are providing power to a television through an AC inverter at a current of 7 amps. If you are looking at a volt meter that is wired to the output of your bike generator so that you carefully pedal at a speed that puts out 14 Volts DC you will only need a small heat sink attached to your regulator. This is calculated by the voltage difference between what is going into the regulator and what is coming out times the current going through the regulator or: (14V - 12V) x 7 Amps = 14Watts. So you need to use a heat sink that can dissipate 14Watts of heat. You can order this at www.digikey.com for $1.94. Part number HS229-ND. You can imagine how much bigger this heat sink would need to be if your pedal power bike generator is putting out a voltage of 20V. That would be (20V -12V) x 7 Amps = 49 Watts. So you would have to buy a heat sink that is 3 times bigger or put a small fan on one heat sink. This is why a linear voltage regulator is SO INEFFICIENT at input voltages much higher than the output voltages, you loose much of your precious energy as it literally disappears into the air - as HEAT! DC / DC CONVERTER: The DC to DC converter more efficient than a linear regulator for situations when you your bike generator is running well over 12 volts., but is expensive if you want to generator in the 50Watt to 100Watt range. Prices range from $50 to $200.